Lifestyle is far more important than most physicians suppose. Dietary changes in China that have resulted from increased prosperity are probably responsible for a marked rise in coronary risk in the past several decades, accelerating in recent years. Intake of meat and eggs has increased, while intake of fruits, vegetables and whole grains has decreased. 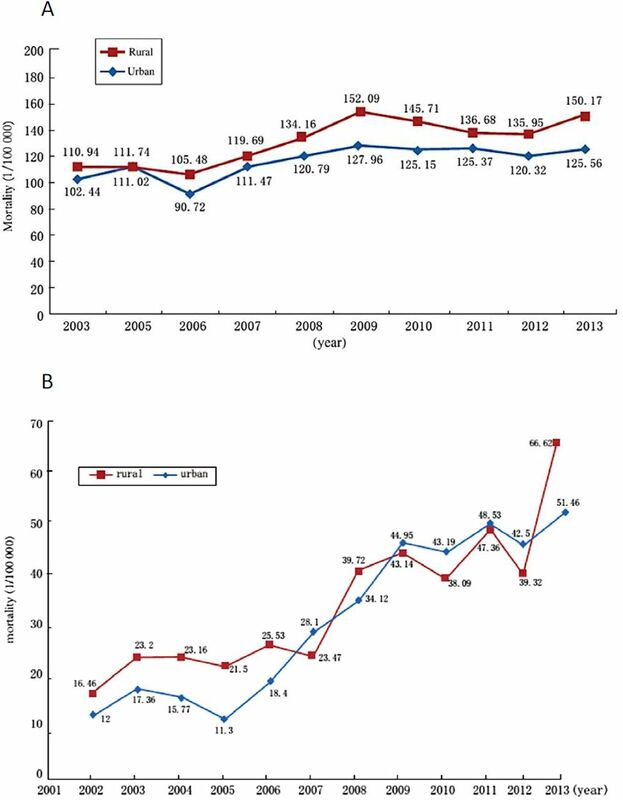 Between 2003 and 2013, coronary mortality in China increased 213%, while stroke mortality increased by 26.6%. Besides a high content of cholesterol, meat (particularly red meat) contains carnitine, while egg yolks contain phosphatidylcholine. Both are converted by the intestinal microbiome to trimethylamine, in turn oxidised in the liver to trimethylamine n-oxide (TMAO). TMAO causes atherosclerosis in animal models, and in patients referred for coronary angiography high levels after a test dose of two hard-boiled eggs predicted increased cardiovascular risk. The strongest evidence for dietary prevention of stroke and myocardial infarction is with the Mediterranean diet from Crete, a nearly vegetarian diet that is high in beneficial oils, whole grains, fruits, vegetables and legumes. Persons at risk of stroke should avoid egg yolk, limit intake of red meat and consume a diet similar to the Mediterranean diet. A crucial issue for stroke prevention in China is reduction of sodium intake. Dietary changes, although difficult to implement, represent an important opportunity to prevent stroke and have the potential to reverse the trend of increased cardiovascular risk in China. When ranked in order of importance, among the interventions available to prevent stroke, the three most important are probably diet, smoking cessation and blood pressure control.1 Hypertension and smoking cessation are discussed in other papers in this issue of the journal. In this paper I discuss diet and stroke prevention. In the past, a low-fat diet was recommended to reduce cardiovascular risk; however, as pointed out by Willett and Stampfer,10 the low-fat diet was essentially ‘pulled from thin air’ by a committee trying to imagine a diet that would lower fasting levels of low-density lipoprotein (LDL) cholesterol. Recent dietary guidelines tend to recommend a dietary pattern, rather than specifying limits to intake of particular foods or nutrients. Increasingly, guidelines are recommending reduction of intake of animal fat and increased intake of fruits and vegetables—a more plant-based diet. The Dietary Approaches to Stop Hypertension (DASH) diet11 emphasised fruits, vegetables and low-fat dairy foods with reduced intake of saturated fat, total fat and cholesterol; it included whole grains, poultry, fish and nuts, and was reduced in red meat, sweets and sugar-containing beverages. This appears to be similar to the Mediterranean diet, but there are important differences: the Mediterranean diet also emphasises whole grains, fruits and vegetables, but it is high in beneficial oils (olive and canola), low in dairy products and contains much less animal flesh. In a retrospective article,12 Ancel Keys, the leader of the Seven Countries Study, described it as follows: ‘The heart of this diet is mainly vegetarian, and differs from American and northern European diets in that it is much lower in meat and dairy products and uses fruit for dessert’. The diet with the best evidence for stroke prevention is the Mediterranean diet from Crete. 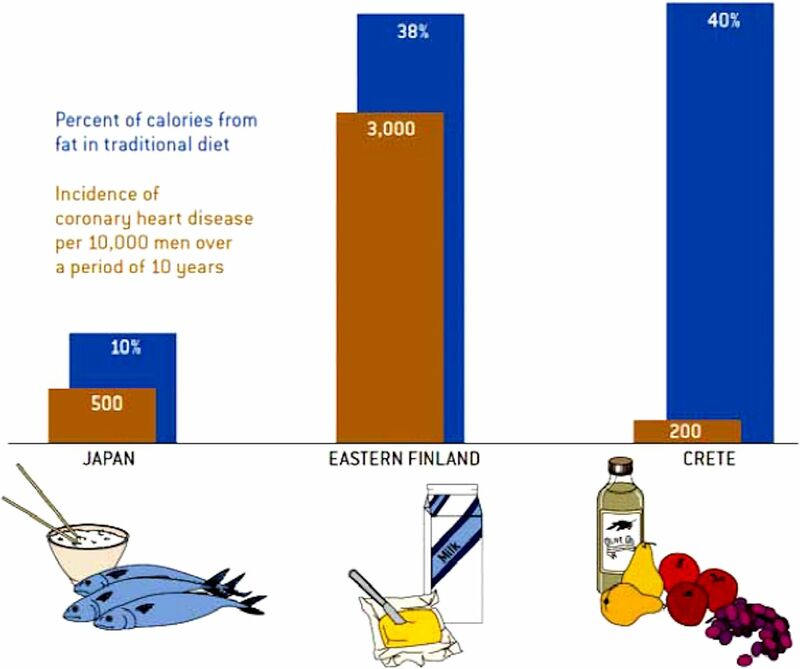 In the Seven Countries Study, it was discovered that coronary risk in Crete was 1/15th that in Finland and only 40% of that in Japan.10 In a retrospective article, Ancel Keys described it as ‘a mainly vegetarian diet…favoring fruit for dessert’. The diet is not a low-fat diet; it is a low glycaemic/high-fat diet with 40% of calories from beneficial fats such as olive and canola oil, and high in whole grains, fruits, vegetables and legumes (peas, lentils, beans, nuts and so on) (figure 2). n secondary prevention, in the Lyon Diet Heart Study,13 the Mediterranean diet was approximately twice as efficacious as was simvastatin in the contemporaneous Scandinavian Simvastatin Survival Study (4S).14 Both studies enrolled patients who had survived a myocardial infarction; in the Lyon Diet Heart Study, the Mediterranean diet reduced coronary events and stroke by more than 70% in 4 years; in the 4S trial, simvastatin reduced recurrent coronary events by 40% in 6 years. In primary prevention, in the Spanish Primary Prevention of Cardiovascular Disease with a Mediterranean Diet (PREDIMED) study,15 a low-fat diet was compared with two Mediterranean diet arms: one fortified with olive oil, while the other fortified with mixed nuts. Both versions of the Mediterranean diet significantly reduced cardiovascular events; the nut-fortified version reduced stroke by 47% in 5 years. In recent years there has been much said about how the dietary villain is not cholesterol and egg yolk but sugar, and some have mistakenly blamed the Mediterranean diet for the low-fat diet that has resulted in a marked increase in carbohydrate intake, with increases in diabetes and obesity.16 However, the low-fat diet did not result from the discovery of the Mediterranean diet. With its high fat content (40% of calories from fat, mainly olive oil)10 and emphasis on whole grains, the Mediterranean diet is actually a low glycaemic diet. The result of this discussion has been a widespread and popular, but entirely mistaken, move to increased use of low-carbohydrate (low-carb) diets, with a high intake of cholesterol and animal fat. This is disastrous, and to a great extent due to propaganda of the food industry.17 Like the sugar industry18 the meat and egg industries spend hundreds of millions of dollars on propaganda, unfortunately with great success.19–21 Box 1 provides links to information about this issue. Although dietary cholesterol does not increase fasting lipid levels by much, it clearly does increase coronary mortality.34 35 However, there is increasing recognition of the importance of the intestinal microbiome.36 While cholesterol content is essentially the same for any kind of animal flesh, red meat has more saturated fat, and has ~4 times as much carnitine as chicken or fish. Carnitine from red meat37 and phosphatidylcholine from egg yolk37 are converted by the intestinal bacteria to trimethylamine, in turn oxidised in the liver to trimethylamine n-oxide (TMAO) (figure 4). TMAO causes atherosclerosis in animal models,37 and in patients undergoing coronary angiograms plasma levels in the top quartile of TMAO levels after a test dose of two hard-boiled eggs predicted a 2.5-fold increase in the 3-year risk of stroke, myocardial infarction or vascular death.38 A 12-ounce Hardee’s Monster Thickburger39 contains 265 mg of cholesterol and 320 mg of carnitine. The yolk of a 65 g egg contains 237 mg of cholesterol and 250 mg of carnitine, so two egg yolks are worse than the 12-ounce burger. Patients at risk of stroke should avoid red meat and egg yolk. Trimethylamine n-oxide (TMAO) is produced by the intestinal bacteria from phosphatidylcholine. Carnitine (largely from red meat) and phosphatidylcholine (largely from egg yolk) are converted by the intestinal bacteria to trimethylamine, which in turn is oxidised by the liver to TMAO. TMAO causes atherosclerosis in animal models and markedly increases the risk of stroke, myocardial infarction and cardiovascular mortality, particularly in persons with renal impairment. It also accelerates decline of renal function. (Permission requested to reproduce from Wang et al. 58) FMO, flavin-containing monooxygenase. Besides TMAO, there are other toxic metabolites produced by the intestinal bacteria from amino acids, including P-cresyl sulfate, hippuric acid, indoxyl sulfate, P-cresyl glucuronide, phenyl acetyl glutamine and phenyl sulfate. These toxic metabolites of the intestinal microbiome are renally excreted, so they may be termed ‘Gut-derived Uremic Toxins’ (GDUT). Their blood levels are very high in patients with renal failure. Other uraemic toxins that have high plasma levels in renal failure are thiocyanate, asymmetric dimethylarginine and homocysteine. Homocysteine accounts for only ~20% of the effect of renal impairment on carotid plaque burden40; we hypothesised40 that GDUT may account for much of the very high risk associated with renal failure.41 Renal function declines linearly with age, and by age 80 the average estimated glomerular filtration rate in patients attending a stroke prevention clinic is below 60 mL/min/1.73 m2.40 We have evidence that even moderate renal impairment significantly increases plasma levels of the GDUT (submitted for publication). This means that persons with renal impairment, including most elderly patients, should avoid red meat and egg yolk. The role of regular consumption of tea or coffee on cardiovascular risk has not been tested in randomised controlled trials. There is moderately good evidence that consumption of coffee and tea reduces risk of myocardial infarction, but little mention of stroke in that body of literature. It seems likely that reduction of myocardial infarction would be associated with reduction of stroke risk. Coffee consumption has been controversial for many years. An early report from the Framingham Study indicated that tea, but not coffee, reduced the risk of myocardial infarction.42 For both tea and coffee there are two issues to be considered: the effects of caffeine and the effects of antioxidants. Some evidence that caffeine in coffee may be harmful came from a study in which slow metabolisers of caffeine (because of a variant of the CYP1A2 genotype) appeared to have increased the risk of myocardial infarction.43 A recent meta-analysis indicates that consuming 3–5 cups per day of coffee reduces cardiovascular risk.44 As both decaffeinated and regular coffee appear to have equal benefit with regard to reduction of cardiovascular disase and diabetes,45 46 it seems likely that benefits of coffee are from bioflavonoids. Consumption of both tea and coffee appears to be beneficial. It is not known if consuming both tea and coffee would be more beneficial. Since consumption of these beverages is a personal preference with cultural differences across countries, it seems unlikely that physicians would prescribe one or the other. A major dietary issue in China is sodium intake. The relationship of sodium intake to hypertension in China was reviewed in 2014.54 Most of the sodium (~75%) in the diet comes from soy sauce and added condiments. The major cause of stroke in China is hypertension, and hypertension is poorly controlled,55 in part because of the cost of medication.56 Restriction of sodium intake has the potential to improve blood pressure control, particularly in patients with higher blood pressures,11 at no financial cost. Patients should be encouraged to use light soy sauce in limited quantities and increase other approaches to flavouring food, such as lemon juice, vinegar, ginger, spices, herbs and hot peppers. Again, such changes would represent a cultural change that would be a challenge to implement. So what diet would be recommended for patients at risk of stroke? Patients at risk of stroke should limit their intake of animal flesh, avoiding red meat and egg yolk. They should have a high intake of beneficial oils such as olive and canola, whole grains, vegetables, fruits and legumes. Egg white is a good source of protein, so omelettes, frittatas and egg salad sandwiches made with egg whites or with egg white-based substitutes are a good substitute for a meat-based meal. Box 2 summarises my recommendations for helping patients learn to make a healthy diet enjoyable. The recipe booklet that I give to my patients can be downloaded from http://www.imaging.robarts.ca/SPARC/. No egg yolks: use egg whites, egg beaters, egg creations or similar substitutes. Flesh of any animal: a serving the size of the palm of the hand or less, ~every other day (or half that daily). Seldom red meat, mainly fish and chicken. High intake of olive oil and canola oil. High intake of vegetables, fruit and legumes. Avoid deep-fried foods and hydrogenated oils (trans fats). Avoid sugar and refined grains, and limit potatoes. A measure that should be considered in China would be converting the population to whole grain rice instead of polished rice. This would no doubt be extremely difficult, but it would reduce the risk of diabetes, stroke and myocardial infarction. Diet is an important part of stroke prevention. Reducing sodium intake, avoiding egg yolks, limiting the intake of animal flesh (particularly red meat), and increasing the intake of whole grains, fruits, vegetables and lentils would contribute importantly to reversing the trend to increased cardiovascular risk in China. Group SSSS. Randomised trial of cholesterol lowering in 4444 patients with coronary heart disease: the Scandinavian Simvastatin Survival Study (4S). Lancet 1994;344:1383–9.
. False and misleading claims by egg marketers: secondary false and misleading claims by egg marketers. 2013. http://nutritionfacts.org/video/eggs-and-cholesterol-patently-false-and- misleading-claims/ (accessed 20 May 2015).
. How the Egg Board Designs Misleading Studies : Secondary How the Egg Board Designs Misleading Studies. 2013. http://nutritionfacts.org/video/how-the-egg-board-designs-misleading-studies/ (accessed 20 May 2015).
. Fasting lipids: the carrot in the snowman. Can J Cardiol 2003;19:890–2.
. A prospective study of egg consumption and risk of cardiovascular disease in men and women. JAMA 1999;281:1387–94.
. Regular egg consumption does not increase the risk of stroke and cardiovascular diseases. Med Sci Monit 2007;13:CR1–8. Healthy people 2000: National health promotion and disease prevention objectives. United States Department of Health and Human Services, 1991.
. ESC/EAS Guidelines for the management of dyslipidaemias the task force for the management of dyslipidaemias of the European Society of Cardiology (ESC) and the European Atherosclerosis Society (EAS). Atherosclerosis 2011;217:3–46.
. Inverse association of tea and flavonoid intakes with incident myocardial infarction: the Rotterdam Study. Am J Clin Nutr 2002;75:880–6.
. Lifestyle modifications to prevent and control hypertension. 3. Recommendations on alcohol consumption. Canadian Hypertension Society, Canadian Coalition for High Blood Pressure Prevention and Control, Laboratory Centre for Disease Control at Health Canada, Heart and Stroke Foundation of Canada. CMAJ 1999;160(9 Suppl):S13–20.
. 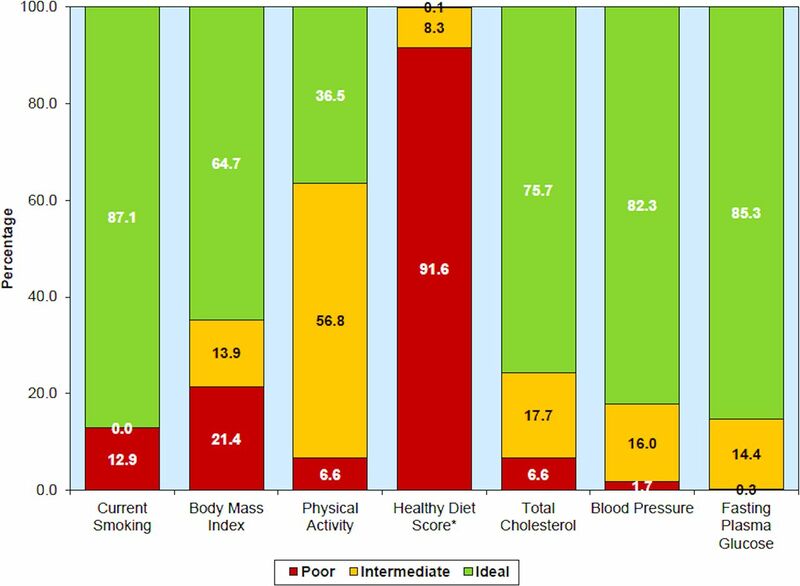 Prevalence, awareness, treatment, and control of hypertension in China: data from 1.7 million adults in a population-based screening study (China PEACE Million Persons Project). Lancet 2017.
. How to prevent your stroke. Nashville, TN: Vanderbilt University Press, 2006.